After a truly magical and breathtaking experience last year, we were very fortunate to have friends join us for this years most beautiful festival. In The Woods Festival oozes mystery, tranquility and brings a small gathering of people together in the most surreal environment within some of the most picturesque woodlands. Putting last years memories aside in an attempt to be surprised again, it was clear to see a new theme without altering the dynamics previously enjoyed. The woodlands beautifully laced with colourful flowers and bright golden lights leading you along the magical footpaths. At the entrance there were some bright pink, yellow and blue cactuses positioned amongst the natural green plants. 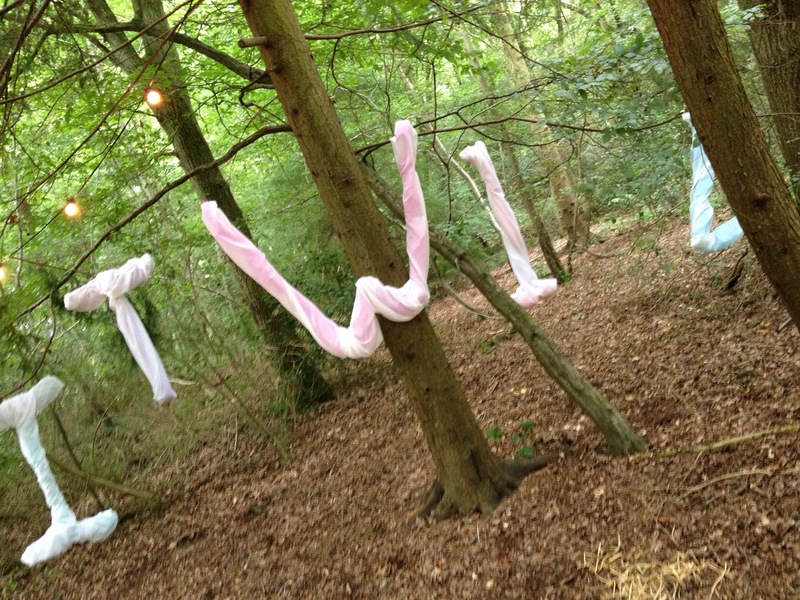 A couple of footsteps later there were trees graced with the largest material letters spelling out ITW14. There were cardboard masks hung by wooden pegs on strings hand painted for people to wear. The pathways winding with many other areas to explore. A material filled tree designed to look like a flowing waterfall was one of the most eye catching pieces. Our friend we met at last years festival had designed a sign that spelt out “But I Love Hymn” a fitting reference to the music we enjoyed during the weekend. Francobollo which had a hand drawn cover, a lovely little momentum of the festival from a new band I discovered. On the first evening we participated in the Pub Quiz which was highly entertaining. Despite accruing a team of ten people we still managed to avoid winning. Either way it was a great chance to mingle whilst drinking some of the local ales they had on tap. Later on we went into the Silent Disco, this is a new concept for me. I’ve always wanted to try one and was unsure what to expect. It transpired to be one of the weirdest yet enjoyable experiences I’ve known. I was presented with some headphones that had 2 channels on them. Whilst listening to the music you could hear the people around you singing either the song I was listening to or the one on the other channel. One things for sure I can’t get Junior Senior or Shanks and Bigfoot out of my head! The music was amazing and some of the bands I really enjoyed discovering were Francobollo, Juffage, Ichi and Febueder. The styles and genres on both sides of the spectrum gave the pallet a mixed variety. The stages are called The Quarry and Laurel Lounge, one is surrounded by trees and slopes that you can perch on a log whilst the others in a clearing within the lush green trees. During the Saturday there was a chance to experience hands-on craft. We created a vinyl print which was cool to print whilst others were making garlands from plants and greens acquired from the woodlands. There was even the opportunity to draw a naked person. Art, Craft and Its diverse nature combined to offer a beautiful cocktail of opportunity for people like me to have a go. The Spinney is a part of the woods where you can sit down on hay bails listening to musicians play and sing whilst wearing headphones. It creates a spooky and chilling atmosphere because without wearing them all you can hear is the vocals and key presses on the keyboard. We heard Sivu play and his style encapsulated the surroundings beautifully. 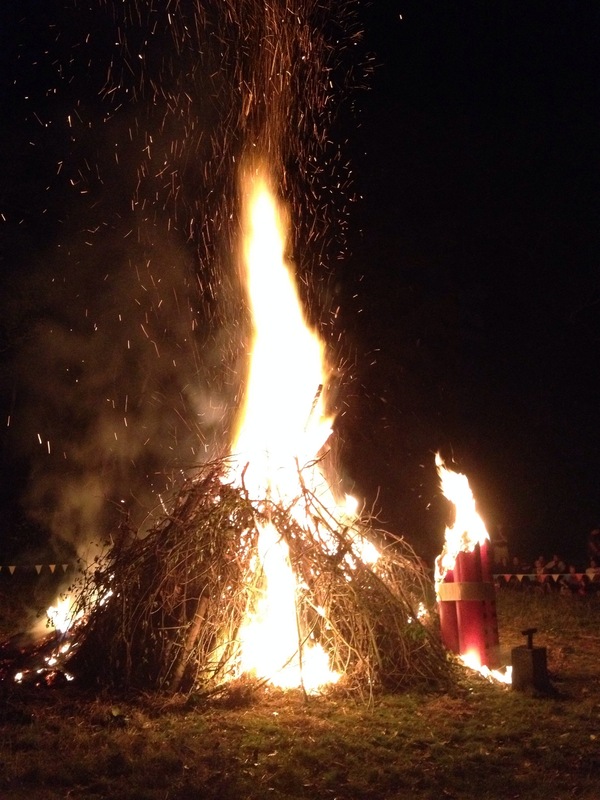 The curtains for ITW14 drew down on Saturday evening with the most anticipated bonfire spectacle. A large plunger with sticks of dynamite were the decoration for an impressive effort. Within minutes the flames were dancing high into the dark sky flicking off fireflies and angels to keep the stars company afar. It was the surreal and comforting end to a beautiful event. Thank you once again for making it so special and I haven’t even mentioned the amazing food on offer! Another portion of Cauldron cooked Beef Curry was enjoyed and we managed to sample the cakes in the Coffee, Tea & Cake hut before they sold out on the Saturday Morning. One criticism and I hate to make it was the increased allocation of tickets taking the event over 1,000 people. This is too much, you could tell the strains this put on certain parts of the festival, please go back to how it was in 2013.